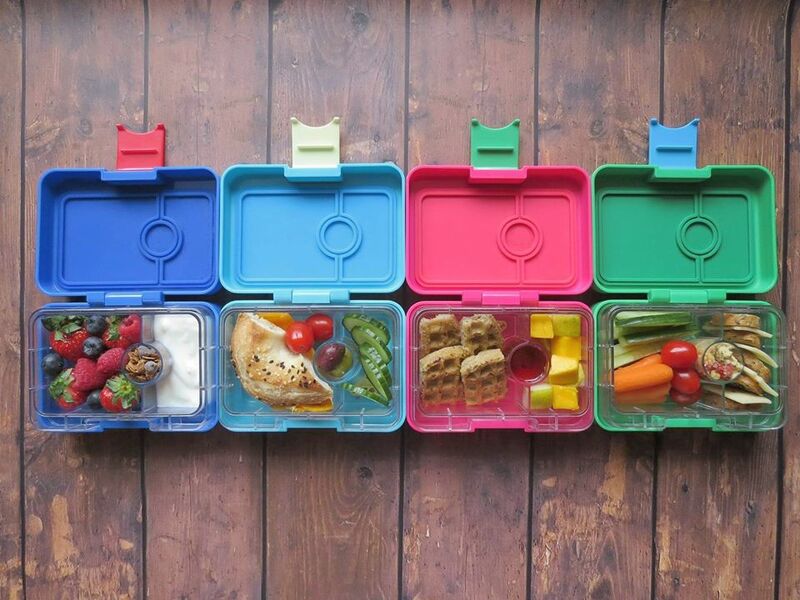 For those of you who are unaware, I am on a mission to post reviews of my favourite lunchboxes and lunch essentials throughout the next couple months. There will also be a few exciting giveaways, so make sure that you are following me on Instagram. Most of you know that I pack school lunches in variety of lunchboxes for Akshaya and Udayan. I kid you not when I say every day I receive emails inquiring about the different kinds of bento-style lunchboxes, where to purchase them, and the pros and cons of each. 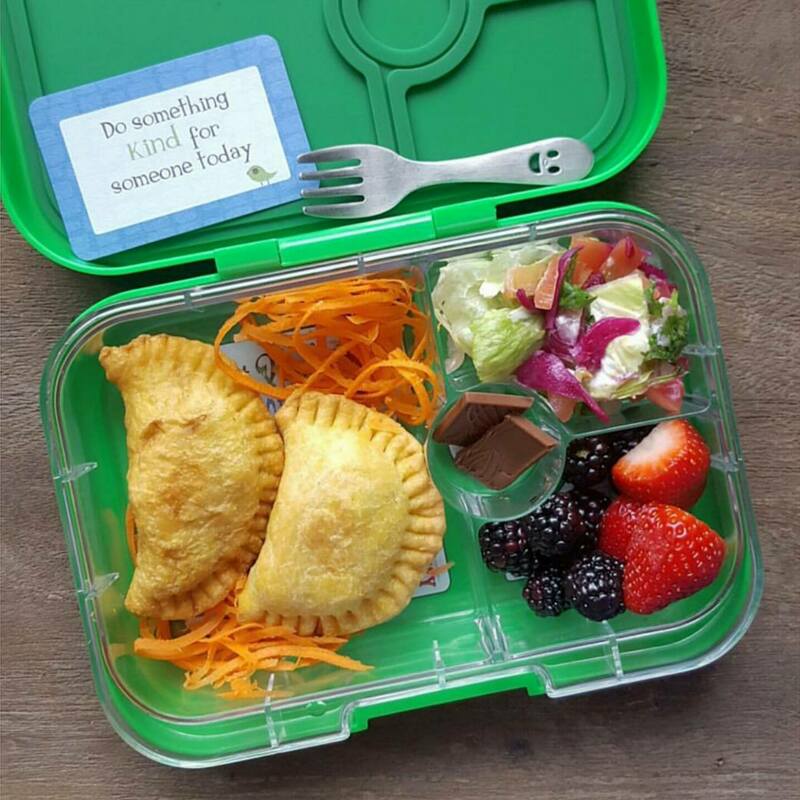 Hopefully these reviews will help those of you shopping around for lunch kits for school or summer camp. Last week I posted my review of the Planetbox. In today’s post, I will be discussing another favourite of mine; the Yumbox. To say that I am a fan of the Yumbox is an understatement! I became slightly obsessed ever since I bought the Yumbox Original for Akshaya when she started kindergarten over two years ago. In the last two years our collection of Yumboxes has grown to include different colours as well as styles, including my favourite one of all, the Yumbox MiniSnack. I own all four sizes of the Yumbox and I love all of them for different reasons. 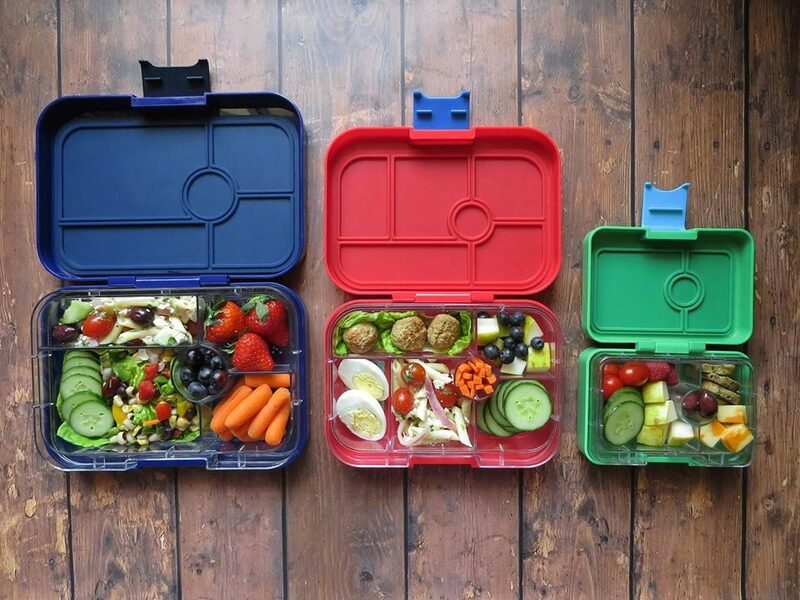 All four styles are leak-proof which is a major selling point when it comes to lunchboxes. Another thing I absolutely love about the Yumbox is its ability to keep foods fresh due to its air-tight seal. This means I can pack lunch a day or even two in advance without worrying about food going bad, stale, or losing its freshness. The Mini Snack is my favourite of all the Yumboxes simply because we get so much use out of them. 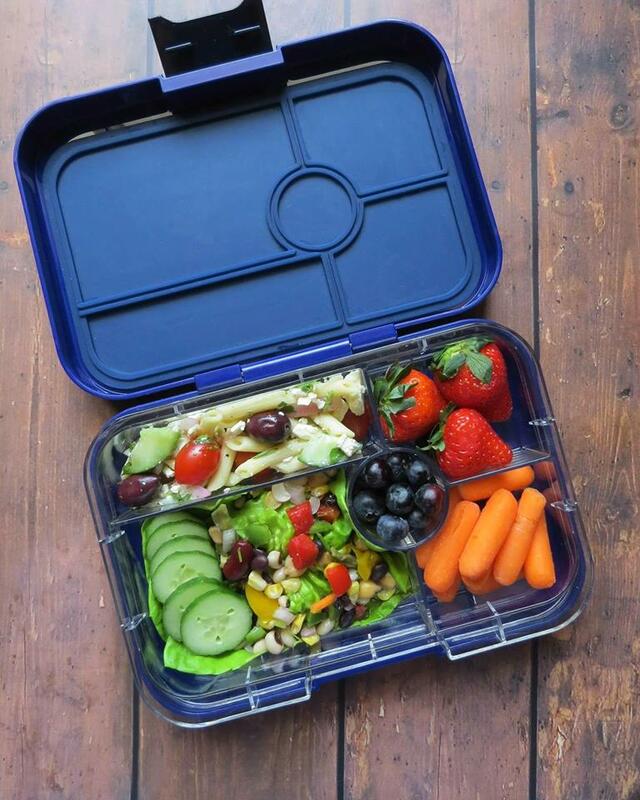 It is the perfect snack box to take to school, in the car, or to an extra-curricular activity. We’ve even taken our MiniSnack with us to the ER and to Akshaya’s hospital appointments. With two compartments (3/4 cup and 1/3 cup) and a treat/dip well, the leak-proof MiniSnack is functional and practical for the little ones. I love that I can pack juicy fruits, yogurt, or even a salad for snack without having to worry about leaks or foods losing their freshness. Currently the MiniSnack comes in four different colours, with a fifth colour soon to be released, and retails for $29.95 CND. The Original, comes with a 6-compartment insert tray and is perfect for toddlers, younger children, and picky-eaters who prefer to graze on a variety of different foods. The 6-compartment tray accommodates five 1/2 cup portions plus treat/dip. I find that the smaller portions in combination with the neat design is quite appealing to picky-eaters. Both my 6-year old and almost 5-year old love the Original because they enjoy eating different foods rather than a lot of the same food. I love the insert tray because it is labelled with the four food groups to help reinforce balanced meal-packing and healthy eating. The insert tray is also wonderful learning tool to teach little ones about the food groups and the importance of making healthy food choices. The Yumbox Original retails for $41.99 CND. The Panino is the same size as the Original but comes with a 4-compartment insert tray that can fit an entire sandwich! 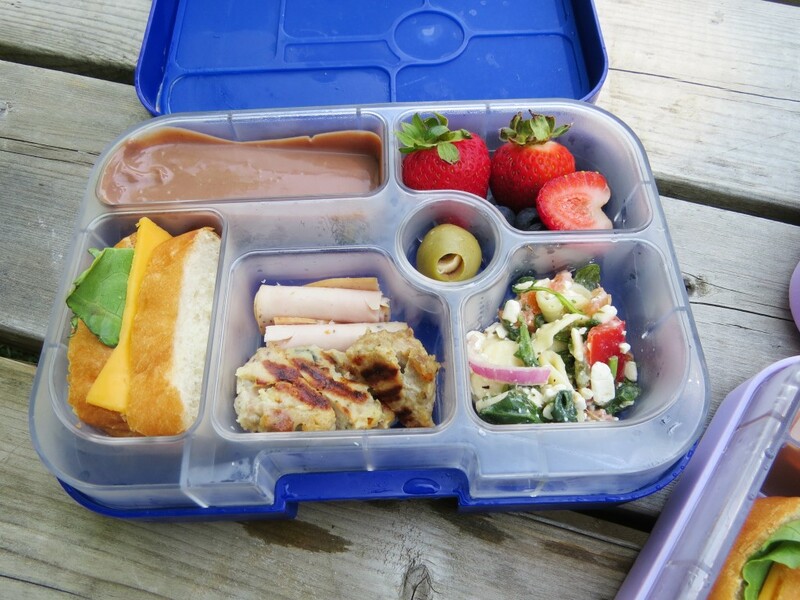 This lunchbox is perfect for older children, teens, adults with smaller appetites, or simply anyone who loves having a sandwich, wrap, or salad for lunch. The Panino accommodates one 2 cup portion, two 1/2 cup portions, and a 1 oz. dip for a total capacity of approximately 3.1 cups. It holds about a half cup more food than the Yumbox Original but retails for the same price of $41.99 CND. 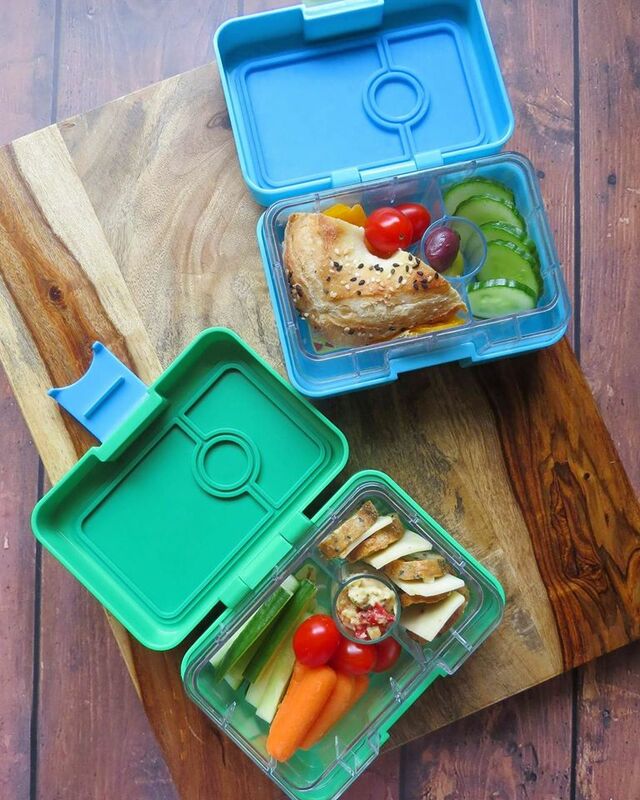 The Yumbox Tapas, the newest addition to the Yumbox line of lunchboxes, is designed for teens and adults. The insert tray holds a total capacity of 4.2 cups in comparison to the Yumbox Original and Panino which hold approximately 3 cups of food. Perhaps the most wonderful thing about the Tapas is that it accommodates either a 4 or 5-compartment tray, depending on which you prefer. The founders of Yumbox, Maia and Daniela, were kind enough to send me a Tapas and I absolutely love it! I find the Tapas is a bit big for my appetite but it is the perfect size for my husband. Residents of the US can purchase the Tapas via Amazon and the Yumbox website. Canadians can pre-order the Taps for $47.99 CND with an expected arrival date of June-July 2017. 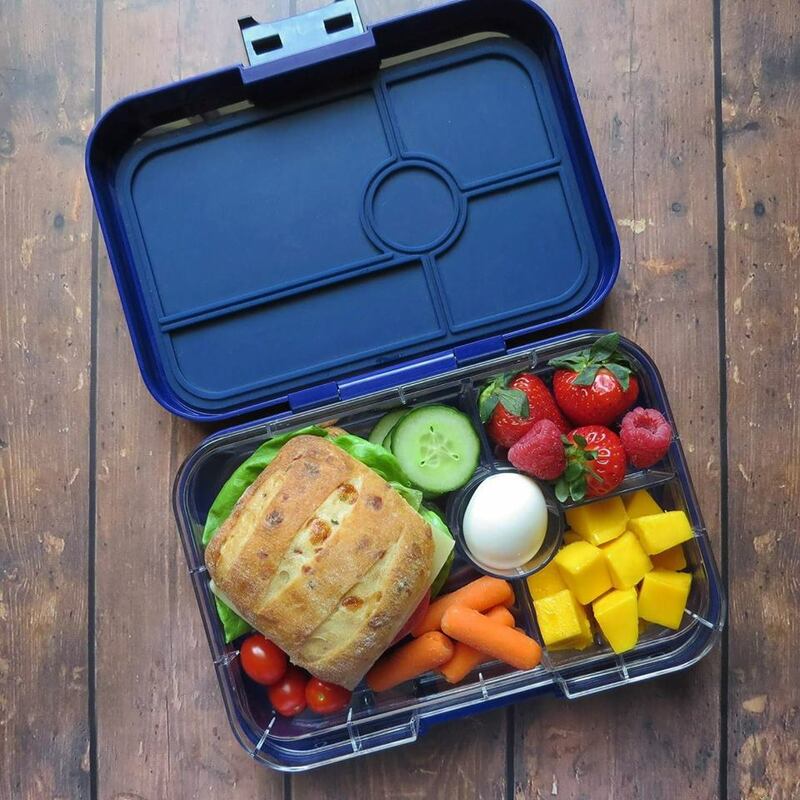 Although only residents of the United States can make an online purchase from the Yumbox website, there are several Canadian retailers that carry this lunchbox as well as other international retailers (see here). All my Yumboxes were purchased from Dalit Sorokin, owner of the online store, Cute Kid Stuff. One thing I absolutely love about Cute Kid Stuff is its amazing customer service. An order is usually shipped out on the same day as it is received so that it gets to you as soon as possible, with a few exceptions of course. However, if you live within the GTA or neighbouring cities, you can avoid the shipping charge and pick it up at a location in the city of Vaughan. For those of you who like to shop in person, Dalit has set up a warehouse in Vaughn in which customers can come shop her large assortment of Yumboxes, other lunch essentials, and bento accessories. Make sure to join Dalit’s Facebook group, Bento Lunch Box Ideas- Canada, to learn more about Cute Kid Stuff’s Ultimate Bento Warehouse including location and hours. Unfortunately the Yumbox is not insulated and therefore does not keep cold foods cold or hot foods hot. Hot foods should be packed at room temperature and cold foods should be packed with an ice-pack. Although the Yumbox is designed to be leakproof, it does not hold liquids. Foods with the consistency of hummus, thick yogurt and dips, applesauce, ketchup, and creamy salad dressing, can be packed. When closing Yumbox, press down on the lid and secure the latch to create the best seal. The contents of the Yumbox must be washed daily after use, to prevent mold from forming on the silicone seal. The Yumbox is best washed in warm, soapy water by hand, however the insert tray IS dishwasher-safe on the top rack. The outer box should always be washed by hand to prevent warping of the tray due to extreme heat. With regular use, the Yumbox will show normal signs of wear and tear such as fine scratches. To minimize the likelihood of scratches and the designs on the insert trays from being scratched off, DO NOT use an abrasive cleaning sponge. It is best to dry and store the Yumbox immediately after washing. Packing oily foods regularly can cause build-up. A simple paste of baking soda and water can be applied and then rinsed off to remove oil buildup. WIth the exception of the Tapas, Yumbox trays are not interchangeable. Although the 6-compartment tray will fit in 4-compartment outer box, and vise versa, it will not create a seal to prevent leaking or spills. The Yumbox Original and Panino fit in a standard lunch tote, however Yumbox does carry a line of spacious, insulated lunch coolers (see here). 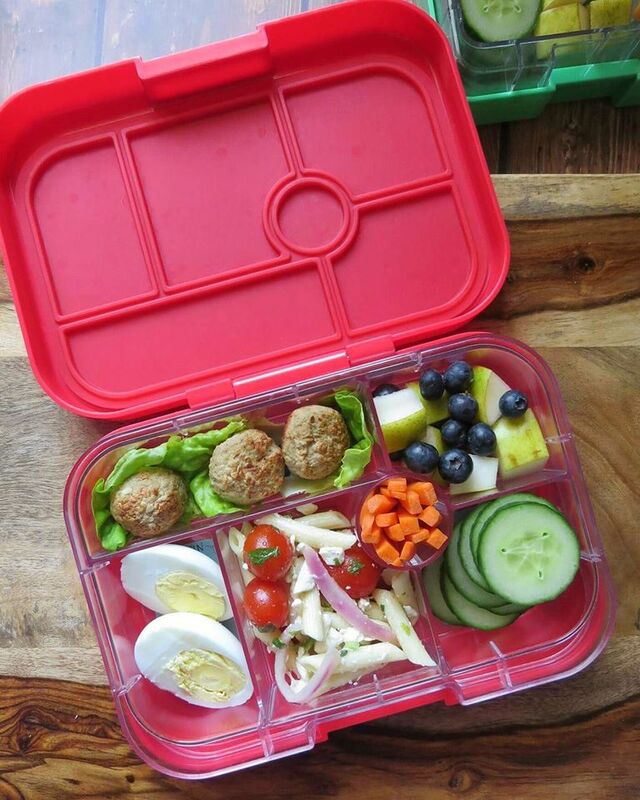 Follow me on Instagram here for lunchbox ideas! any ideas on what kind of insulated bag will accommodate the tapas? I don’t want the sleeve b/c there is no room for a water bottle. Yumbox recently released a cooler bag large enough to fit the Tapas plus a few extra things.